AWO—Weakening The Jones Act (continued from page 6) built ships operating in interna- tional trade, allowing those ships to compete on an equal basis with the foreign shipping trade. Domes- tic trade ships were guaranteed no such subsidies on the basis that domestic trade ships already en- joyed fair and thriving competi- tion among themselves. Clearly, to allow subsidy-built ships into the domestic trade would give those subsidy-built ships an unfair com- petitive edge, one which was not intended by the Act of 1936, and which would disrupt the current environment of fair competition in the Jones Act fleet. 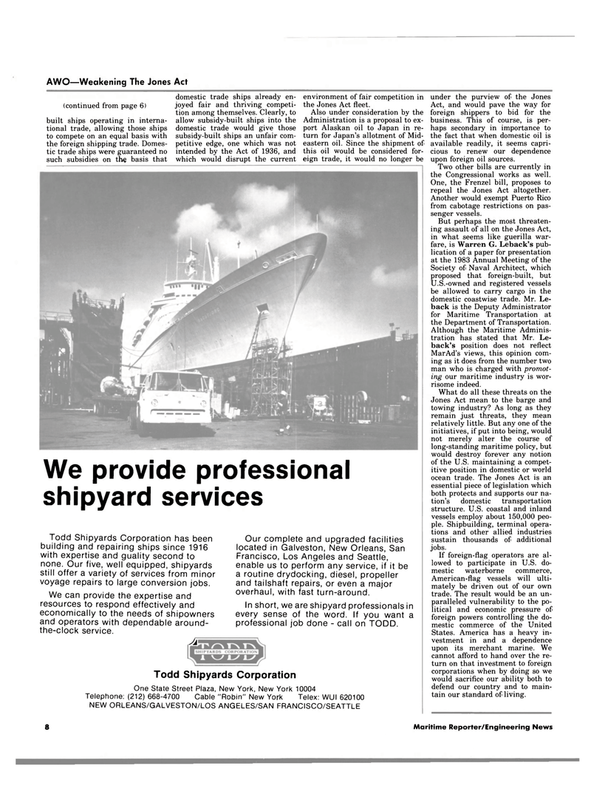 Todd Shipyards Corporation has been building and repairing ships since 1916 with expertise and guality second to none. Our five, well equipped, shipyards still offer a variety of services from minor voyage repairs to large conversion jobs. We can provide the expertise and resources to respond effectively and economically to the needs of shipowners and operators with dependable around- the-clock service. Francisco, Los Angeles and Seattle, enable us to perform any service, if it be a routine drydocking, diesel, propeller and tailshaft repairs, or even a major overhaul, with fast turn-around. In short, we are shipyard professionals in every sense of the word. If you want a professional job done - call on TODD. Act, and would pave the way for foreign shippers to bid for the business. This of course, is per- haps secondary in importance to the fact that when domestic oil is available readily, it seems capri- cious to renew our dependence upon foreign oil sources. Two other bills are currently in the Congressional works as well. One, the Frenzel bill, proposes to repeal the Jones Act altogether. Another would exempt Puerto Rico from cabotage restrictions on pas- senger vessels. U.S.-owned and registered vessels be allowed to carry cargo in the domestic coastwise trade. Mr. Le- back is the Deputy Administrator for Maritime Transportation at the Department of Transportation. MarAd's views, this opinion com- ing as it does from the number two man who is charged with promot- ing our maritime industry is wor- risome indeed. Jones Act mean to the barge and towing industry? As long as they remain just threats, they mean relatively little. But any one of the initiatives, if put into being, would not merely alter the course of long-standing maritime policy, but would destroy forever any notion of the U.S. maintaining a compet- itive position in domestic or world ocean trade. The Jones Act is an essential piece of legislation which both protects and supports our na- tion's domestic transportation structure. U.S. coastal and inland vessels employ about 150,000 peo- ple. Shipbuilding, terminal opera- tions and other allied industries sustain thousands of additional jobs.